The ultra-compact MiniCore RCM6700 is ideal for today’s smart energy initiatives as well as other applications that require a cost effective web-enabled device server. It provides up to 6 serial ports, configurable I/O and control features such as PWM. The RCM 6700 series also offers a much greater feature set than comparable device servers—and at a lower cost. The RCM6700 series is fully programmable, taking advantage of processor peripherals. The programming environment, Dynamic C, is an ANSI C compatible development environment that provides a royalty free TCP/IP stack and Wi-Fi support. Various protocol support such as ZigBee and Modbus are also available to help reduce development costs and time-to-market. 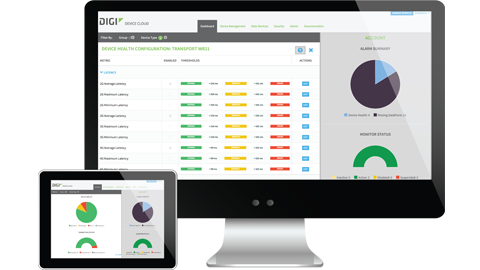 The Digi Remote Manager platform simplifies device deployment by allowing devices to easily pass through firewalls, eliminating server maintainance and costly on-site visits. Our integrated hardware and software solution allows the RCM6700 series to be fully programmable within Dynamic C®, an ANSI C compliant development environment. Complete samples and libraries are included to dramatically reduce development time from months to weeks. The Digi Device Cloud platform eases the burden of device deployment by providing complete remote monitoring and control, thereby eliminating server maintenance and costly on-site visits. The RCM6700 series are high performance device servers which contain a multitude of device connectivity options. This includes an I2C interface, A flexible interface module, FIM which extends peripheral connectivity like CANbus, 1-Wire and SD/SDIO. 32 Configurable I/O and up to 6 serial ports, the RCM6700 series provides more capabilities from the standard device servers without sacrificing costs. The series is also pin compatible with MiniCore 802.11 b/g modules. Custom samples and ready libraries dramatically reduce development time from months to weeks. Programming is done in Dynamic C which is ANSI C compatible allowing for easier code porting from existing applications. Digi Device Cloud allows you to easily integrate device data into M2M applications. Access data from edge devices and perform bi-directional communication. Integrate data from any device (including non-Digi hardware) through open APIs and Cloud Connector. Securely manage devices en masse for increased efficiency.